The NASA/ESA Hubble Space Telescope has found signs of Earth-like planets in an unlikely place: the atmospheres of a pair of burnt-out stars in a nearby star cluster. The white dwarf stars are being polluted by debris from asteroid-like objects falling onto them. This discovery suggests that rocky planet assembly is common in clusters, say researchers. 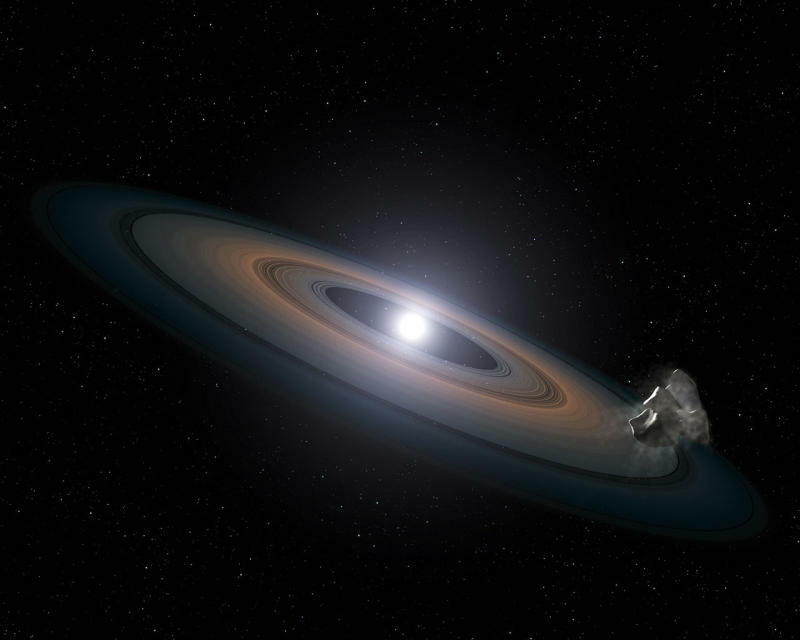 Artist's impression of debris around a white dwarf star. The stars, known as white dwarfs - small, dim remnants of stars once like the Sun - reside 150 light-years away in the Hyades star cluster, in the constellation of Taurus (The Bull). The cluster is relatively young, at only 625 million years old. Astronomers believe that all stars formed in clusters. However, searches for planets in these clusters have not been fruitful - of the roughly 800 exoplanets known, only four are known to orbit stars in clusters. This scarcity may be due to the nature of the cluster stars, which are young and active, producing stellar flares and other outbursts that make it difficult to study them in detail. Hubble's spectroscopic observations identified silicon in the atmospheres of two white dwarfs, a major ingredient of the rocky material that forms Earth and other terrestrial planets in the Solar System. This silicon may have come from asteroids that were shredded by the white dwarfs' gravity when they veered too close to the stars. The rocky debris likely formed a ring around the dead stars, which then funneled the material inwards. The debris detected whirling around the white dwarfs suggests that terrestrial planets formed when these stars were born. "We have identified chemical evidence for the building blocks of rocky planets," says Farihi. "When these stars were born, they built planets, and there's a good chance that they currently retain some of them. The signs of rocky debris we are seeing are evidence of this - it is at least as rocky as the most primitive terrestrial bodies in our Solar System." Besides finding silicon in the Hyades stars' atmospheres, Hubble also detected low levels of carbon. This is another sign of the rocky nature of the debris, as astronomers know that carbon levels should be very low in rocky, Earth-like material. Finding its faint chemical signature required Hubble's powerful Cosmic Origins Spectrograph (COS), as carbon's fingerprints can be detected only in ultraviolet light, which cannot be observed from ground-based telescopes. "The one thing the white dwarf pollution technique gives us that we won't get with any other planet detection technique is the chemistry of solid planets," Farihi says. "Based on the silicon-to-carbon ratio in our study, for example, we can actually say that this material is basically Earth-like." The team plans to analyze more white dwarfs using the same technique to identify not only the rocks' composition, but also their parent bodies. "The beauty of this technique is that whatever the Universe is doing, we'll be able to measure it," Farihi said. "We have been using the Solar System as a kind of map, but we don't know what the rest of the Universe does. Hopefully with Hubble and its powerful ultraviolet-light spectrograph COS, and with the upcoming ground-based 30- and 40-metre telescopes, we'll be able to tell more of the story." The two "polluted" Hyades white dwarfs are part of a search of planetary debris around more than 100 white dwarfs, led by Boris Gänsicke of the University of Warwick, United Kingdom. Using computer models of white dwarf atmospheres, Detlev Koester from the University of Kiel in Germany is determining the abundances of various elements that can be traced to planets in the COS data. Seeing evidence of asteroids points to the possibility of Earth-sized planets in the same system. Asteroids are the building blocks of major planets. Planet-forming processes are inefficient, and spawn many times more small bodies than large bodies - but once rocky embryos the size of asteroids are built, planets are sure to follow. The team estimated the size of the in-falling asteroids by measuring the amount of dust being gobbled up by the stars - about 10 million grams per second, equal to the flow rate of a small river. They then compared that data with measurements of material falling onto other white dwarfs. The Hyades study offers insight into what will happen in the Solar System when the Sun burns out, five billion years from now. The international team of astronomers in this study consists of J. Farihi (University of Cambridge, UK; STFC Ernest Rutherford Fellow), B. T. Gänsicke (University of Warwick, UK), D. Koester (University of Kiel, Germany). The new study is appearing in the Monthly Notices of the Royal Astronomical Society.